Wondering How To Optimize Your Content for Google Voice Search? Read This! Blog » SEO » Wondering How To Optimize Your Content for Google Voice Search? Read This! In 2018, more people are using Google voice search to find out content as quickly as possible. As a business do you need to optimize your website content for Google voice search? Read this article, I am going to show you exactly what to do in order to generate more business by optimizing a website for voice search. According to Statista, the world we know is swarming up with smartphones. Up to 2.32billion smartphones in use worldwide by the start of 2018 and is estimated to grow to 2.53billion by the year-end. The way people interact and search content on smartphones have radically revamped over the past few years. Today, more users resort to voice-commands using a variety of ‘virtual assistants’ on different platforms, popular ones such as Siri on Apple, Google Assistant on Android and Cortana on Windows. You, as a small business, need to make your website content Google voice search friendly. In today’s tutorial, I will share some of the techniques which you can integrate into your SEO marketing to increase the visibility and ranking of your business equally on voice searches as in typed-searches. But first, let me give you a brief overview of what Google voice search is. Google Voice Assistant which was previously known as voice search. It is a self-learning AI bot created by Google to perform different tasks on different platforms. Since this article mainly covers the topic of voice search, we are not going into details what other things it can perform. Google voice assistant take voice commands from human searchers and give an answer. It works on every major OS capable of connecting to the Internet. Google’s webmaster John Mueller provided some tips on content optimization for Google Assistant in a recent Webmaster Central Hangout. In addition, Google officially released guides for publishers on how to make their content more visible for Google Assistant. 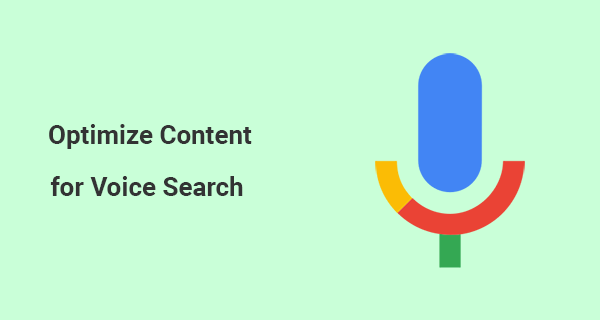 How to optimize content for Voice Searches? Here are some of the ways which are recently introduced by Google to optimize content. Design and layout your content in a natural or conversational tone. A natural way of speech is completely different from typed search phrases. People use voice search more often for local search purposes on their mobile devices. Additionally, such searches have long-tail queries than conventional searches. It is an essential element to provide information to Google. It will help Google identify your content to appear in relevant voice searches. Structured Data is a standard format that provides information about a page to search engines. It marks up every item such as products, services, reviews etc. You can look up for the complete list of markups on schema.org. Despite the difference in approach to searching, the results of voice search are not any different from a typed result. Keep in mind, there is no separate index for voice searches. In case of local searches, Local SEO is very much important to cater the users’ local purchase intent. Make sure information on the contact page includes information such as; contact information, nearest landmark, store hours, and directions. Claiming and optimizing your Google My Business listing will tremendously improve the occurrences of appearing in search results when a relevant voice query is triggered. As I mentioned above, in this context, provide every possible detail about your business like industry, phone numbers, email, business hours etc. While tailoring and optimizing your website to work seamlessly with Google Assistant is important, over-optimization for voice searches will negatively impact the quality of content. Creating short content just to cater to voice searches represents a poor content quality of an overall website. So, adopt rather a ‘balanced’ approach. An effective way to avoid over-optimization is to create a FAQ page which answers the most common questions by your customers. By creating a FAQ page, or adding a FAQ section under each category on your website will help users as well as search engines to understand your website. Try to make the content more conversational to help Google pull information from your site. Create effective FAQ pages answering most anticipated questions. If you can comply with Google rich snippets prerequisites, your site will appear higher in both voice and text-based searches. As I advised earlier, your content should be more natural or conversational. Using excessive tables and including external links makes it hard for Google Assistant to crawl and present the information according to the voice search. The table or charts data would not be understandable in audible format via Google Assistant. Similarly, Google Assistant is unable to click on external links if you include too many on your page. Google Assistant will show up information pulled from the website in a Snippet for typed searches. On the other hand, if a voice query has been searched by a user, Google Assistant will pick up information from the top result and read it to the user. According to ComScore, 50% of online searches will be through voice by 2020. The true potential of voice search is still to be unlocked but as they say,‘early bird gets the worm’. Every small business needs great planning and hard work to devise SEO strategies and optimize content which can be read aloud clearly. In such a case, your content becomes a successful candidate for Google to pick up from the search result. Check out this post on how to remove negative search results. If you are looking for an SEO to optimize content on your website, I can help you. Please check out my SEO services and get in touch.